As most of you old school Can followers are aware of, former frontman and vocalist Damo Suzuki has put out an awfully lot of live CD recordings, like this one. ' 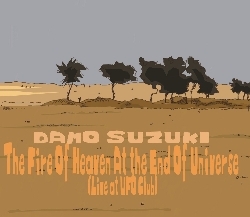 Fire of Heaven...' was recorded at a live gig on March 5, 2006 at the UFO Club in Tokyo. It's a good import title to seek out. Liked the opening track, the upbeat as well as improvised (seems to be anyway) "The Crystal Desert" as much as I did the other four cuts this disc has to offer. "Moonlight Warrior" is a long-winded Avant Garde piece that features some odd noise sampling, but the song gets better as it progresses. Thought that "The Last Night Of The Sun" had several blissful psychedelic moments, the lengthy 28-minute "Dress Your Girl" was a bit stagnating and "Another Dirty Weekend" employed a full throttled swirling psychedelic vibe to it. Very nicely done. Label describes this live CD as being trans-kraut psychedelic. Have to pretty much agree with that. Basically, if you dig past live Damo Suzuki releases, you should get plenty out of this disc just as I did. Line-up: Damo Suzuki - vocals, Hoppy Kamiyama - keyboards, Kenji Sato - bass, Yuji Katsui - violin and Tatsuya Yoshida - drums. A fine pick to add to your music collection. Disc gets better each time you play it.